Ringya: Your Contacts And Beyond! Ringya is the new app in town. It’s one of the easiest ways to organize your phone contacts that I have ever seen. •	Puts all those phone numbers you often tack onto your fridge door or bulletin board into your smartphone – literally in a snap, with zero effort. •	Saves time and stress from scrambling to find a contact list within email archives because your work, class or team contacts are right at your fingertips. •	Provides instant access to people you need to contact but otherwise wouldn’t have added, one at a time, to your personal address book. •	Ability to share contact lists with teams and group members in one easy step. •	Presents a simple way to communicate with individuals or entire groups via email, text messaging and phone calls. •	When Ring member updates contact information, the entire list automatically gets the update so contacts stay current. •	Contextual caller ID shows who’s calling you and how they fit into your world (eg. Sally Jones, VP Sales, Max Sales Team) (eg. John Smith, Jane Smith’s Father, Oak View 2nd Grade). •	Offers a simple way to put contact lists at your fingertips with no help from the IT department or an assistant, and no need to struggle importing or exporting contacts. •	If a Ring includes the names of children and parents, they will also be listed in context, i.e. “George’s Mom,” “Aiden’s Dad”. •	Stringent security technology and policies protects users and list members. •	Absolutely no third party distribution of user information. To learn more about Ringya, check out this YouTube video which can explain this app better than I can. You can follow Ringya on Twitter and Facebook and read their blog. And, you can get this App for yourself at the App store. 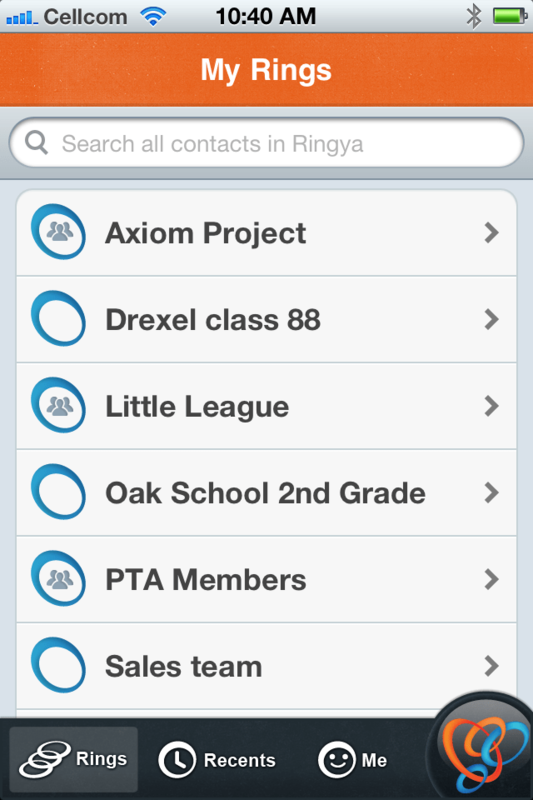 Right now, Ringya is only compatible with the iOS but soon, it will be available for you Android users. Disclosure: I am receiving compensation for this sponsored post. However, no one can buy my opinion, no matter how much money. If I say something is cool, I mean it. And, this app is really cool.